This WebQuest is a guided research activity that will be accomplished with a partner. All parts of this lesson will first be presented in class during the lecture/presentation. During the presentation you are encouraged to complete the graphic organizers that were handed out at the beginning of the class. An electronic copy is attached if needed. 1. What was the Treaty of Versailles? Why did it make the German people very unhappy? 2. List and explain three of Hitler’s aggressive actions from 1934 to 1936? 3. Why didn’t the League of Nations stop Hitler? Give four reasons. 1. Which countries were invited to the Munich Conference? Which was not? 2. Why did European nations like Britain and France adopt a Policy of Appeasement in response to Hitler’s actions? 3. Was the Munich Conference successful in securing ‘Peace during our time’ like British P.M. Chamberlain claimed? 1. When did Canada declare war? On who? 2. Why did Canada wait a week after Britain to declare war? 3. Were Canadians reluctant to go to war? Did memories from WWI still affect them? 4. Why did the Canadian Government not like the idea of using Conscription to recruit soldiers for the war effort? 1. What was the Maginot Line? Did it work? 3. How long did it take Germany to capture France? 4. Why was France unable to defend itself? Where were all of their troops? 1. What is Propaganda? How did the Canadian Government use it? 2. What are War Bonds? Why did the Canadian Government want Canadian citizens to buy them? 3. Why was rationing food so important during wartime? List three different food Canadian rationed. 4. What are some of the ways Women assisted the war effort from the home front? 1. What was the Spitfire summer? When did it happen? 2. What areas did the German forces focus their attack on? 3. What was the Blitz? Why did it start? 4. Why did the battle end? How many were lost on both sides by its conclusion? 1. Why were the British, French and Belgian forces trapped at Dunkirk? 2. When did the evacuation happen? 3. Who was involved in the evacuation? 4. Why was this event considered a miracle? 1. Why did the allies chose to launch an attack at Dieppe? 2. What was the code name for the attack? 4. How many Canadian soldiers were lost? 5. What was the lesson learned at Dieppe? 1. What role did Canada play in the invasion of Sicily? 2. What was the invasion of Italy called? 3. Why was the Italian campaign forgotten? How many Canadians were killed? 5. What happened to Italian leader Benito Mussolini? 1. When did the war in Africa really begin? 2. Which two European countries fought over much of Northern Africa? 3. Who was in charge of Germany’s forces in Africa? 1. What propaganda did Hitler and the Nazi's use against the Jewish population in Germany? 2. How did the Jewish population resist the persecution of the Holocaust? 3. What was the range of years in which the Jewish population were prosecuted? 4. List the 5 countries in which the most Jewish people were murdered and the numbers for each. 1. What dates specifically did the Yalta Conference take place and which countries were involved? 2. List four of the major points which were made at the Yalta Conference? 3. What major agreements were made at the Potsdam Conference? 4. Give a two-sentence summary of the Potsdam Declaration. 1. What attack by the Japanese began the War in the Pacific? On which date did it occur? 2. What is a kamikaze pilot and why was this important? 3. Give a paragraph description, including dates, of three of the major battles in the Pacific campaign. 4. What two events ended the War in the Pacific? When did they occur? 1. What were the five main beaches attacked on D-Day and which countries were responsible for each? 2. 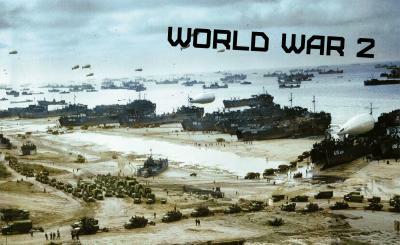 What was the code name for the D-Day invasion? 3. What percentage of Canadian tanks were sunk before they made it to the beach? 4. What town were Canadian soldiers supposed to ride their bikes to after taking Juno Beach? 1. What were the names of the two Nuclear Bombs which were dropped on Japan? 2. What was the code name for the project to develop the Nuclear Bomb? 3. What was Canada's contribution to the development of the Nuclear Bomb? 4. On what date did the Japanese surrender to end the war? What date was V J Day and what does this acronym stand for? Your final task is to create something that represents an aspect of WWII. It can be a song, a poem, a poster, a website, a PowerPoint, a scrapbook, a collage, a model of a battle or event, a letter, an advertisement, a video, a brochure or an essay. This will be done individually.